Here's a little YouTube video from The Chieftain about a 1957 Chevrolet 1503 US Army Staff Car that I thought some of you guys might find interesting. Apparently this car is available at Rock Island Auction Company if you happen to have a spare $20,000. Does anyone know if there is a 1957 Chevrolet 150 offered in 1/25? The "Black Widow" kit below is a 150 body, but it comes with a V8 only, not the Blue Flame straight 6. You? Biased for Chevrolets? I don't believe it! I found that kit, too, after I made the post; but it's a 2-door where the car in the video is a 4-door. Not exactly sure I could pull of that conversion. 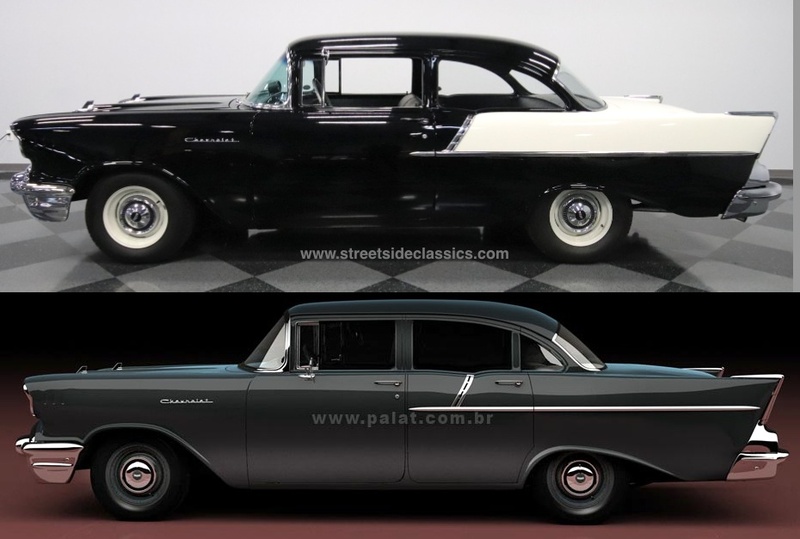 Fortunately, I found this: Star Models 1955 Chevrolet Bel Air 4dr Sedan Would the 1503 have had the Blue Flame straight 6? And the kit doesn't have a rear seat, either. Yep, whoda thought that D had a thing for Chevys? And if that's your plan for the 150, you're a braver man than I. Not sure if I'll really be able to pull it off, though. The actual; staff car is a 1957, while the resin piece is a 1955. They look similar, but I don't know if the 57 chrome pieces will fit on the 55 resin body. And then there's the issue of the straight 6. Now there's a build that I've never seen before. Looking forward to following your build. And thanks for the two videos, I did learn quite a lot from the tour one. Talk about a base line model. I just had to google the cost of a base line model: $2424,32. I'm sure that back then you really negotiated from there on down, and I can see the car going out the door for $22-2,300 or so, as no one paid full sticker price back then. I was really surprised at just how cramp the interior was for a full size sedan. I did like the vinyl treatment on the door panels just for the military. This looks pretty close to me. I know the bottom car is an illustration but I think it's doable using two of those Revell kits that D posted above. Relocate and add a couple B and C-pillars and filling and scribing some door lines. You're assuming that I have a modicum of talent, which I don't. I wonder if using a combination of the center 1955 resin kit and the nose & tail of the 1957 plastic kit would be possible. Then there's that talent thing again. That's a 2-door 1957 Chevrolet 210. It's a nice looking car, but not for this build. Might pick it up anyway because I like a 1957 Chevrolet.